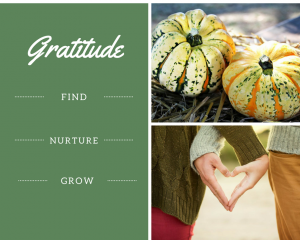 I invite you to join me in exploring ways to nurture gratitude. The process of caring for and encouraging the development of gratitude could take many forms. Previously, we discussed how to find gratitude, especially in noticing things we are thankful for and making a list of these things. Reviewing those lists could be one way of nurturing the gratitude that you have already noticed in your life. A way to go a bit deeper is to utilize prayer and meditation to nurture gratitude. It might be helpful to actually define what I mean when I use the terms prayer and meditation. In this instance, it is defined as setting aside time, when you will be uninterrupted and can fully focus on your intention in the presence of the Divine. In this case, your intention is to notice and nurture gratitude in your life. Giving some special care and attention to the moments in your life that you are thankful for so that they may become more abundant. One thing that I enjoy bringing into my prayer or meditation sessions is sacred texts. Examples of these could be your gratitude list, a favorite poem or scripture. I have compiled several scripture passages that involve gratitude or thanks giving. Sometimes it is helpful to read how others express their gratitude in order to expand our own definitions. I invite you to look them over and see if one of them stands out to you. Lectio Divina is a Latin term that means divine reading. It is a way of reading scriptures, poems or any sacred text, where you gradually let go of your own agenda and open yourself to what God has to say to you. 1. Read (Lectio): The first time listen to the passage in a general way, simply enjoying the presence of God’s Word. Try not to analyze the scripture, instead allow it to wash over you. 2. Meditate/Reflect (Meditatio): During the second reading, listen for the word or phrase that stands out to you. Perhaps jot it down in your journal. 3. Pray (Oratio & Contemplatio): The final time, listen for what the Spirit might be wanting to say to you through the word or phrase in step 2. What personal message does God have for you today in this sacred text? Focus on only the word or phrase that stood out to you. My guideline for Lectio Divina explains the practice in more detail and walks you through a sample session. I recommend setting aside at least 10 minutes for this type of devotion. If you would like to receive my newsletter and be the first to know about new spiritual resources, then click here to Join the Journey. Also, I have set up a Still Sacred Facebook Group, where you can communicate with others that have also decided to explore spirituality in the everyday moments of life with gratitude and humor. Come join us!